Orphaned siblings must cope for themselves in wartime Japan. As the country faces defeat, society’s structures also fall, and the two children find themselves in a desperate situation. 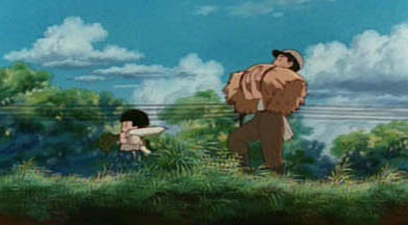 If you have not viewed Grave Of The Fireflies, then it is quite possible that you have not had the opportunity to fully appreciate the true power that animated filmmaking can wield. Even true animation connoisseurs will find this film affecting like no other. The movie’s impressive credentials back up my statement. It won two First Prizes at the 1994 Chicago International Children’s Film Festival— in the categories of Best Animated Feature Film, and Rights Of The Child. It received similar treatment in Moscow. Still, nothing can really prepare you for the impact the film has when you view it. (And I doubt that even the 2005 live-action version packs a more powerful punch.) Its wartime storyline, unfortunately, resonates with what is happening in the world right now, which adds further strength to what is already a tale that hits home on many more personal levels. 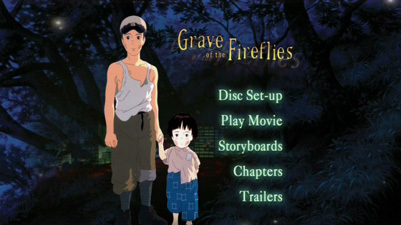 Grave Of The Fireflies, produced in 1988, is based on a semi-autobiographical novel by Naoki Award-winning author Akiyuki Nosaka. It opens in a train terminal, where we hear the narrator naming the day that he died. He then reminisces back to the final months of the Second World War, as Japan is being firebombed by the Allied Forces. The Americans are never actually mentioned by name; they are only The Enemy. In Kobe, the townspeople must head for their shelters, as fire rains down from above. Many are injured, including the mother of teenage Seita and his little sister Setsuko. Because of the mother’s grave injuries, the children must set off for their aunt’s house in Nishinomiya, hoping for refuge. The rest that follows is a simple story of Seita trying to preserve his sister’s childhood, which is nearly impossible given the circumstances. Aside from the weakening of the Japanese forces, the very spirit of the people is waning. Everyone seems more selfish and more apathetic towards others. Despite this, Seita does what he can to keep his sister cheerful. This becomes increasingly difficult, as they must endure a falling out with their aunt, which leads Seita and Setsuko to strike out on their own. Without any adult guidance or assistance, the situation becomes grimmer, and it becomes a struggle to survive at all. 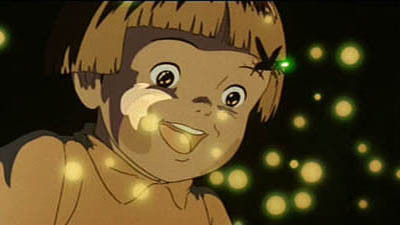 One of their few happy moments comes when they fill a cave with Fireflies, but the fate of the fireflies serves to give the film its title. Thus, even joyous moments lead to sadness. Seita is not mature enough to fulfill the basic needs of him and his sister, and he is unable to adequately fill the role of his father, who is at war. Even when Seita does swallow his pride and seeks help, he receives none. Nevertheless, the loving brother continues to find the time to be playful with Setsuko. The viewer is therefore torn between scenes of inspiration and those of sorrow. Although we are viewing the plight of two young innocents, we are in fact seeing them against the backdrop of a shattered country and its people. Various scenes show us that the nobility present in Seita is disappearing in his countrymen. 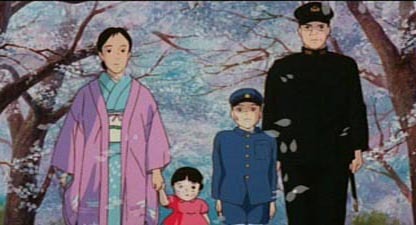 Partially because of Seita and Setsuko’s isolation, they are unaware of the full truth of the war situation. This makes the response of their neighbors all the more frustrating and confusing. The war is not going well, and food is becoming even scarcer than it was just months earlier. 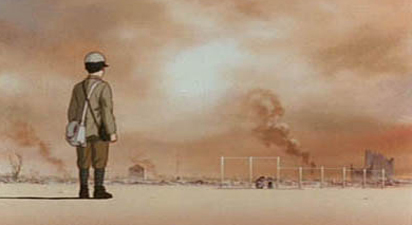 As the story progresses, we see Seita become more knowledgeable of what is happening with the war, and the fate of both his country and his own father. Eventually, all that keeps him going is his love for his little sister, but his immaturity and inexperience ultimately cause him to fail her just as his country failed him. The tragedy of this is that the viewer cannot decide whether to be angry about Seita’s failings or to pity him. After all, he is just a boy, lost amidst a terrible war. The words of a reviewer cannot fully impart the effect of the film. The emotions are brought to the forefront not so much by the plot, but by smaller moments. During the still, quiet moments, the children and the viewer are left to their own thoughts. 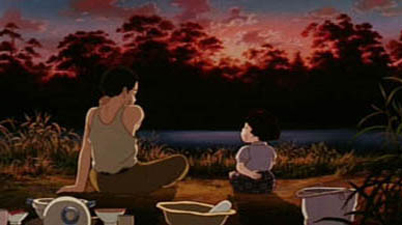 Director Isao Takahata was intelligent enough to know that the most powerful emotions accompany silence, not thunder. He takes his time in this story, allowing the “dull” moments to bring a stronger sense of reality. 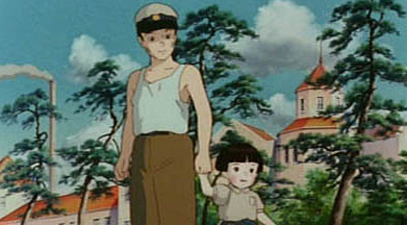 We truly feel that we are watching these two children make their way through 1945 Japan, not just watching a movie. So, when the gut wrenching moments come, we are affected as if we were participants rather than spectators. While I was watching the movie, someone who shall remain nameless (but is married to me) started quietly sobbing. She had not cried during Saving Private Ryan or Schindler’s List, but she did during Grave Of The Fireflies. That should tell you something. This film stays with you for a long time afterwards, too. Stories like this help to make one thankful for one’s blessings, and to discount the minor problems that soil our lives. Central Park Media previously released a rather unspectacular version of this film a few years ago, but has followed it with an impressive two-disc “Collectors Series” version. (This is one of the few Studio Ghibli films not distributed on DVD by Disney.) Now, Region 1 fans of the film can view it in a digitally restored anamorphic transfer, and gain a new appreciation for it through a wonderful assortment of extra features. Now here’s where the Grave Of The Fireflies: Collectors Series really shines. We start things off on the first disc, which offers an extra viewing angle for the entire movie. The second angle is actually the Complete Storyboards Of The Film, which is definitely something that animation aficionados can sink their teeth into. Here we have graphic storytelling in its purest form, undiluted with ink or paint. Disc 2 serves up further goodness. First, though, is a little complaint. The menus were not programmed correctly, so it can be frustrating to navigate them. The disc opens up with the Main Menu, but the viewer often ends up at the “Bonus Storyboard” menu when a featurette ends, and the same (often, but not always) goes for when “Main Menu” is selected from another menu. This glitch spoils an otherwise exemplary presentation on Disc 2. As we begin the bonus features, we first can view a twelve-minute Interview With Roger Ebert. He has always been a champion of animation in general, including Japanese anime. 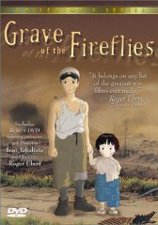 A quote of his, proclaiming Grave Of The Fireflies one of the best war films ever made, even shows up on the cover. In the featurette, he shares his own insights on what makes the movie work, especially on an emotional level. Examples are shown from the film itself to illustrate his points. He also discusses why the movie was best suited for animation, as he felt that the abstract quality of drawn artwork somehow makes the story purer. I found this interview to be insightful and interesting. The next selection from the main menu is Creative Team Extras, which leads us to a menu with four choices. The first of these is an Interview With The Director, Isao Takahata. This 17-minute featurette, subtitled in English, sees the director discussing how the film evolved, casting choices, style, and how the film was received. In lieu of a full-length audio commentary, this was quite a nice piece. As a bonus during the director interview, we are also shown the Ghibli studio, which would be a neat place to visit in person. Bios for original author Akiyuki Nosaka and also Takahata follow this. These are presented in video-based text, lasting less than two minutes each. The bios serve as nice primers, but of course do not go into great detail. Lastly on this menu, we get a Japanese Release Promo, which is better than it sounds. This feature, just under seven minutes long, gives us vintage (subtitled) interviews of the author, director, and art director. We finish up with a US Trailer, actually a promo for the DVD itself, and the true Japanese Trailer. Both discs contain a variety of trailers for other Central Park Media anime titles. DVD-ROM: The DVD-ROM materials included on disc 2 utilize Macromedia software to present Credits, the complete Script, another view of the Art Gallery, the Cast, Reviews and Rewards, and Web Links. Clear keepcase with tray. Credits are viewable through the interior of the case. Apparently, the people at Central Park Media were surprised to have received an anamorphic transfer from the Ghibli studio, and were quite happy to have the opportunity to present it to Region 1 fans. I have not seen the previous version, but it was likely similar to what was shown in the restoration featurette shown on Disc 2 of this set (i.e. a bit muddy-looking). Central Park Media did a full digital clean-up of the film, and the result is very good, if not necessarily spectacular. I did not notice any significant blemishes or compression problems, and the generally muted color scheme was shown to its best effect. Considering the subject matter, one cannot expect the screen to be filled at all times with vibrant colors, although these do show up when appropriate, giving them greater impact. I was still left feeling that the image was slightly softer than what one sees in newer animated films placed on DVD. This is not a large criticism, however, since an overly crisp picture would perhaps not be appropriate for a historical movie about those on the losing side of war. There is a little too much reliance on edge enhancement, resulting in halos if you look for them; but I was too wrapped up in the film to really notice it, even on my 51” 16:9 screen. Overall, it is a very pleasing transfer that suits the film well. The new Collector’s Series version includes Dolby Digital 2.0 tracks in both Japanese and English. (There are also English subtitles available, of course.) The track remains clear at all times, but will not blow you away. Again, this is a movie told on a personal scale, not as an epic war spectacular, so the audio seems appropriate to the film. The folks behind the DVD were careful to keep the non-verbal soundtrack elements at equal levels between the two language tracks, so even the English dub sounds “right”. The one drawback to the dub, however, is that it did not sound like they used a young girl for Setsuko’s voice, as was very intentionally done for the Japanese track. 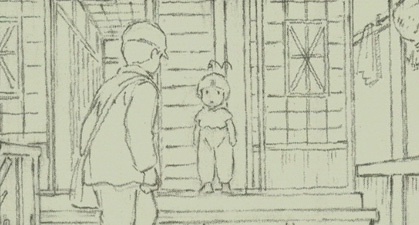 Of course, the Japanese producers did have one advantage: faced with the prospect of using a young girl to dub the part (Japanese animated films up to that time had been dubbed even by the Japanese cast after the animation was already finished), director Takahata intervened at the pencil test stage to have the animators adjust their drawings to a pre-recorded voice track from the young actress. The English dub, however, sounds like a woman pretending to be a little girl. Other than that, the English dub is well done. In fact, when switching back and forth, I often thought that the English track synced better with the animation than the original Japanese one. I tend to always recommend watching a film in its original language, and certainly you would not want to miss out on hearing Grave Of The Fireflies in its original tongue, with the subtleties intact; but you cannot go too wrong here with the English track if you insist on using it. This DVD is highly recommended, just on the basis of the film itself. The extra features, impressive in their depth and commentary, add greatly to the value of the DVD. The story is somewhat melancholy, but is punctuated by moments of lyrical joy and truth. You will likely never see an animated film (or any film) more moving or humane than this. The response on your first viewing may very well shock you, no matter how I try to prepare you. This is a film to be experienced, not passively watched. Whether it is likeable or not is hardly even the issue, as it is simply great and powerful. After seeing it, you will very likely be changed, with an enhanced sense of perspective. Days afterward, you may find yourself thinking back to the experience of seeing Grave Of The Fireflies and trying to remember who you were before you were transformed.